On Thursday, June 1, 2017, at 12:00 p.m., the Award Ceremony for the students who took part in and distinguished themselves in the 1st Ancient Greek Language and Literature Competition took place in the Pierce Faculty Lounge. 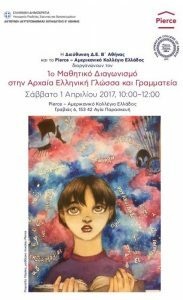 The Competition was organized by the Directorate of Secondary Education B Athens in cooperation with the American College of Greece and 99 students from public and private schools in the region took part. In attendance at the event were the award-winning students and their parents, teachers from their schools, as well as all those who contributed decisively to the organization of the Competition by officiating in the various Committees: the Director of Secondary Education B Athens Mr. Athanasios Faloukas, the School Advisor for Philologues Ms. Foteini Metaxaki, Ms. Maria Koutsousi from the Directorate of Secondary Education B Athens, Ms. Eleni Papadopoulou, Advisor at the Institute of Educational Policy, Directors of Pierce Lyceum and College teachers. In his opening address, Mr. Faloukas congratulated the College on taking the initiative in organizing the Competition and expressed his hope that it would be repeated with the same level of success and participation in school years to come. The event ended with the organizers’ commitment to hold the Competition once again and to make efforts to involve even more participants. Thus, more students will have the opportunity to study in depth and qualitatively the roots of our language, in which the basic principles of western as well as world civilization were first expressed. he Competition involved students of A Lyceum, from both public and private schools under the Directorate of Secondary Education B Athens, and participation was optional. The Competition lasted for two (2) hours. The competitors were given a prose text in the Attic dialect from the original, up to 20 lines and they were asked to answer 2 groups of questions. translation of the extract into Modern Greek (20 points) and structural and linguistic analysis with sub-questions referring to grammar (10 points), syntax (10 points) and etymology (20 points). The format of the questions could be objective type (True or False, multiple choice and matching), transformation type within phrases as to number, voice, tense and declension, or word formation (etymology exercises). the ideas and values of the given text in relation to modern reality (20 points) and the students’ knowledge of Ancient Greek literature (20 points). The units on Grammar and Syntax that belong to the syllabus of all 3 Gymnasium classes and of A Lyceum (2016-17 school year). From the school reference book HISTORY OF ANCIENT GREEK LITERATURE A, B, AND G GYMNASIUM (PUBLISHED 2015, ITYE “DIOFANTOS”) pages 13-30 (except pg. 24), 65-76 (until the end of chapter. 5), 79, 83-85, 89-91 and 98. Prose texts in attic dialect of the 5th and 4th centuries BC. The competition took place on Saturday, April 2, 2017, 10:00 -12:00. Pierce – The American College of Greece (6 Gravias St., Agia Paraskevi) was set as the competition venue. Those responsible for conducting the Competition were the Director of Secondary Education B Athens and the Lyceum Director of Pierce – The American College of Greece. On the day of the Competition, the students were asked to arrive at the campus of the American College of Greece by 9:30 a.m. and to have with them their Identification Cards and 2 blue or black pens. The evaluation was based on a scale of 1 – 100. If there was a difference of up to fifteen (15) points, the score given was the average of the grades awarded by the two markers. In case of a difference of more than fifteen (15) points, there was a re-evaluation by a member of the Academic Advisory Board and the final score was the average of the re-evaluator’s grade and the grade that was the closest to it of the two grades awarded in the first evaluation. The three (3) students that had the highest scores were awarded in a special event organized by Pierce – The American College of Greece. The ten (10) students with the next highest scores in the ranking received Honorable Mention. All of the participants received a Certificate of Participation.